An international team of scientists has used DNA to determine that groups of dusky sharks and copper sharks living in different coastal regions across the globe are separate populations of each species. Tina and Jewel, two Asian elephants owned by the circus, are protected by the Endangered Species Act. The aggressive wolverine may not be powerful enough to survive climate change in the contiguous United States, according to new research by the National Center for Atmospheric Research. We need more data, the American Bird Conservancy said, adding that environmental oversight or assessment can help developers be certain that significant numbers of birds will not be harmed. A new study provides evidence that cultivating coca bushes, the source of cocaine, is speeding up destruction of rain forests in Colombia. Two year's into his term, Obama gets good grades for greenhouse gas endangerment finding but poor ones for endangered species from the Center for Biological Diversity. The Center for Biological Diversity and Pesticide Action Network claim that the agency has failed to properly protect more than 200 endangered and threatened species from harmful pesticides. Over the last 25 years, federal agencies have worked to bring the plant's population from seven to 163,000. Researchers from the University of Washington say the Mariana crow, a forest crow living on Rota Island in the western Pacific Ocean, will go extinct in 75 years, almost twice as soon as previously believed. Billfish and tuna, important commercial and recreational fish species, may be more vulnerable to fishing pressure because of shrinking habitat according to a new study. A novel project that uses cameras mounted on unmanned aircraft flying over the Arctic is serving double duty: Not only is it assessing the characteristics of declining sea ice, but it’s also using the same aerial photos to pinpoint seals that have hauled up on ice floes. On Jan. 1, 2011, Pennsylvania will become the 36th member state of the Interstate Wildlife Violator Compact, under which the convicted wildlife violators will stand to lose their hunting privileges in all states enrolled in the compact, according to Pennsylvania Game Commission Executive Director Carl G. Roe. Sea-ice habitats essential to polar bears would likely respond positively should countries curb global greenhouse gas emissions. NOAA’s Fisheries Service issued its final interim rule to reduce commercial fishing for groundfish stocks in the Aleutian Islands in an effort to provide more food for the endangered western Steller sea lion. Bouchard Transportation Co. Inc. and its affiliates will pay more than $6 million to settle a portion of the federal and state natural resource damages claims for the April 2003 spill of up to 98,000 gallons of oil into Buzzards Bay, according to the Department of Justice. An Alliance for Zero Extention map poinpoints sites where endangered wildlife are located and could be used to identify places that need habitat protection. Javier Garcia found 13 groups of the species using a GPS and listening for their distinctive calls. The company is working with Focus Wildlife, the Department of Natural Resources and the U.S. Fish & Wildlife Service to minimize the impact on birds and wildlife in the area. A bird and wildlife rehabilitation center is now operational. 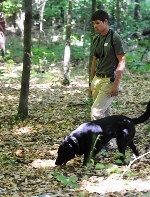 Training dogs to identify specific animal excrement, Auburn University is gathering data on species having the greatest conservation need. Data of unaffected waters is critical to measuring ecological impact of Deepwater Horizon BP oil spill; agency also determines fishery disaster for Louisiana, Mississippi, and Alabama.